The most exciting moment of my life will always be the moment I saw my just-born daughter’s face. I can’t imagine anything could ever match that. But holding the Advance Review Copy of my new novel Love is a Four-Legged Word (published by Berkley Sensation and to go on sale on July 7), is also up there on the scale of exciting moments. Bound in a plain yellow cover, the uncorrected proofs are my very first sight of my book. And I love it. The designers at Berkley have done an amazing job on the book design. Even without the cover (which I also love) the book is beautiful. The typefaces they have chosen are perfect. As a magazine editor in my “day job”, I’m used to having quite a degree of say on design on “my” magazine. Not so with my novel. I to-ed and fro-ed with the cover of and had some input. But the page proofs were the first time I saw how the inside of the book will look. And I wouldn’t change a thing. Clever, clever designers – thank you! 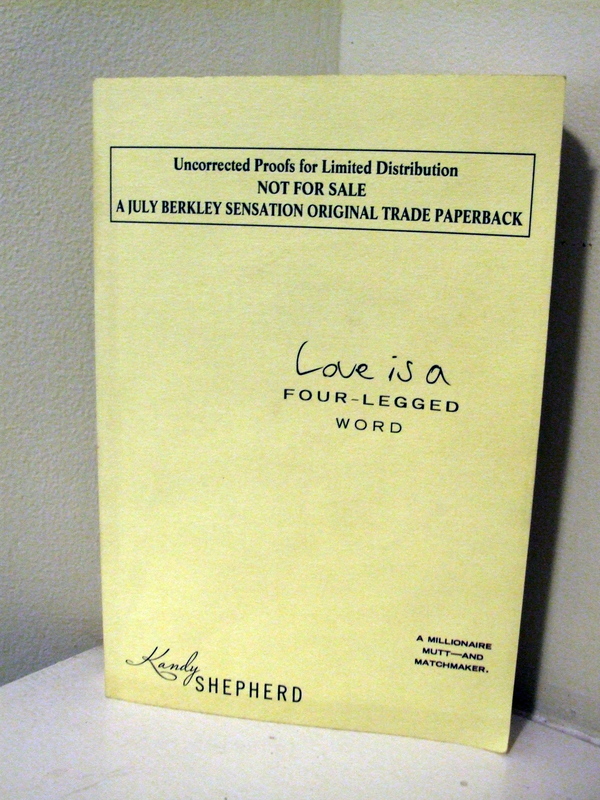 WHAT I’M READING NOW: The Advance Review Copy of Love is a Four-Legged Word by Kandy Shepherd of course!